CHRC has a large number of items that have been digitized through various digitization projects, partnerships, patron research requests, and social media initiatives. We endeavor to provide standardized descriptive practices and open access to this growing collection over the web. CHRC's Omeka site features a growing set of digitized graphics, photographs, documents, and ephemera. These materials can be found here. Through a partnership with CHRC, the Digital Library@Villanova has digitized books, papers, and periodicals owned by the American Catholic Historical Society, the majority of which relate to Irish American history. ACHS material can be found here and CHRC Historic Papers can be found here. The Catholic Historical Research Center's oral history program, which focuses on the life histories of retired Diocesan priests, serves to fill gaps in the historical record. Excerpts can be found here. 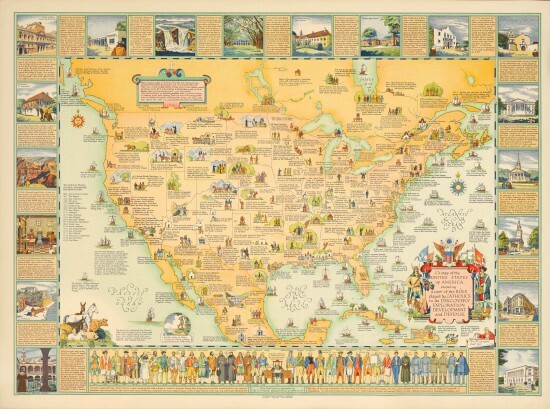 A Map of the United States of America Showing a Part of the Role Played by Catholics in its Discovery, Exploration, Development and Defense. 1941. Chicago, IL : Rand McNally & Company.